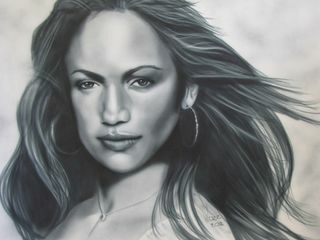 This is an airbrushed portrait I did from an image that I had never seen before. 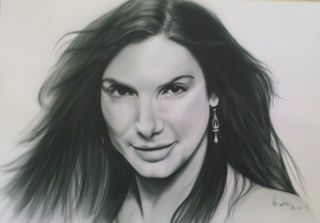 Holly, a lovely young woman from Auckland contacted me to see if I would Airbrush it for her so she could give it to her fiance for his 21st birthday. It turned out that his name is Jimi and he is a huge JIMI Fan, as am I, so with all that in mind I did it and thoroughly enjoyed it. I delivered it to Holly and she was stoked, Hope you two are still enjoying this! A truly outstanding talent sadly died too young!! Very hard to find good reference pics taken before the surgeons ruined his face. 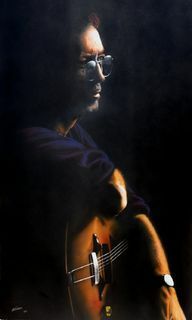 This portrait was airbrushed for a loving wife to give to her Clapton fan musician husband, as his Xmas gift. 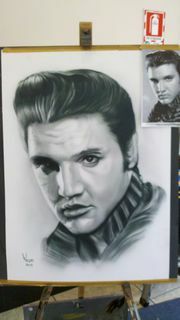 It is airbrushed with auto paint on alloy signboard, and is approx 1200mm x 600mm. I enjoyed doing this piece as I thought the reference image was particularly good, showing him in a really pensive mood. 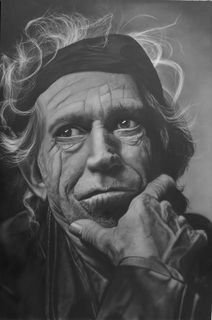 I am a huge fan of his and I enjoyed attempting to put a soul into this work. 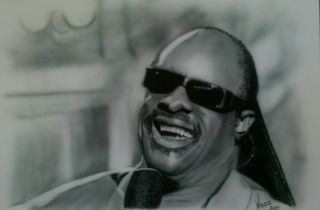 Another "arty Celeb Portrait" painted "live" in front of the crowd at the local Mall. The big worry is the ink is transparent on white paper so it is " Sudden Death".... no error corrections if you make even the tiniest mistake!! 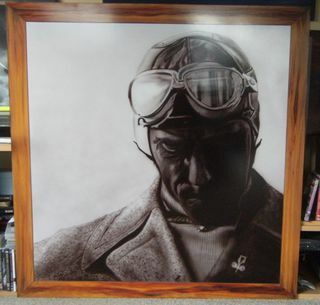 A portrait of the Great Italian 30's Race Car Driver, which was commisioned to hang in Nuvolari Italian Restaurant in Rotorua N.Z. Great food at reasonable pricing. Fun to do a second portrait of Tazio. But this was quite different, very similar from chin up, but must be wearing his famous lucky yellow ribbed, turtle neck sweater instead of his greatcoat, his gold turtle on his chest, his Italian national colours neck scarf, and his leather racing jerkin. Harri also wanted a black "woodgrained" frame painted around his reveered race car driving hero! 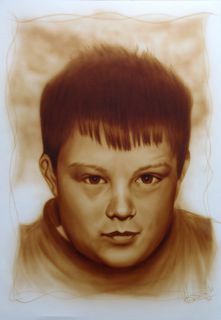 I did this portrait of Anthony for his lovely mum Mary as a project on Tony Vowles' Airbrush Venturi Advanced course learning how to do "Supermarket Mall Arty Portraits in transparent Sepia tones". 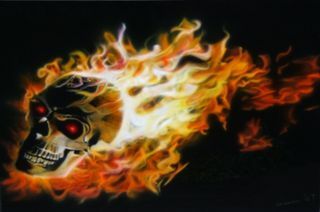 Airbrushed demo panel of the Ghost Rider Image done at Airbrush Venturi Custom Graphics 2 Course. Really enjoyed this. It really teaches how to do "TRUE" + "REAL FIRE" properly. Image on a 850mm x 400mm steel panel. I used a black basecoat, four colours and minor use of candys for depth. SANDRA...... What more do I need to say except YUMMMM!!! 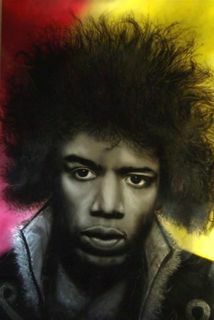 Jimi Hendrix - The Man! 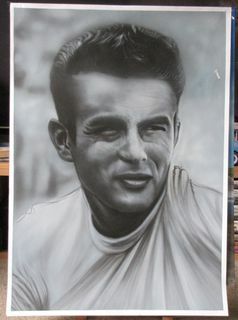 Over the years I have done several portraits of this man. He is a legend in my eyes. Painted 5 versions of this image over this summer in the Mall. Portrait of the great Janis Joplin, Another great blues singer. 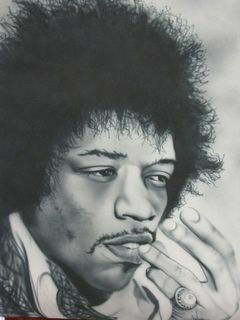 She, Hendrix, and Jim Morrison, were 27 when they died, tragic, but not surpising, losses. 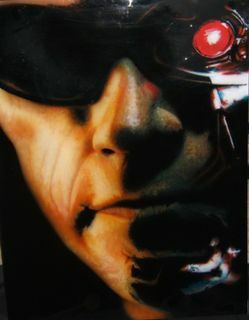 Airbrush rendering of The Terminator done during the third week of the "Airbrush Venturi "course, the course I would recommend to anyone wanting to learn airbrushing. See the 'links' page on this site! 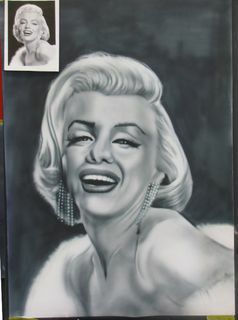 This is airbrushed on metal using Basecoat and uses extensive "texturing" techniques it is 800mm high x 600mm wide. A friend suggested I airbrushed Jaylo. I dont know her music but she sure is a beautiful woman!!! 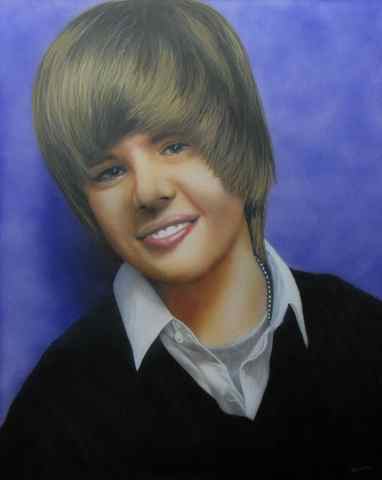 Kim is one of my drumming pupils and "the worlds biggest Justin fan" so for her 13th birthday she wished for a portrait of him. This is what she got, and was thrilled to bits.